Interns have spoken: Abbott is the top college internship program for healthcare and tech & engineering. 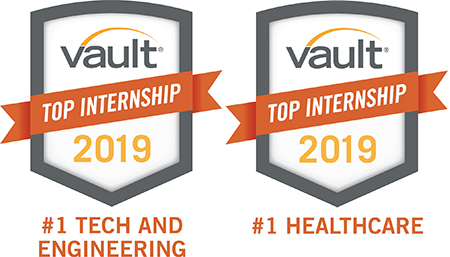 Abbott recognizes the need to develop its future leaders early, and has been named the top healthcare and tech & engineering internship program by Vault. We start by sponsoring programs in elementary schools, continue with a unique high school STEM internship program and culminate with our college internship program, which landed No. 7 overall on Vault’s Top 50 Best Internships list for 2019, a ranking that evaluates surveys of major companies’ interns across the country. Mike Comilla started out as a finance intern at Abbott in 1995 – today he’s a divisional vice president in Investor Relations. "My internship gave me the opportunity to see first-hand what it means to work in finance,” Mike said. “It’s like the difference between reading about driving a car and actually getting behind the wheel. It gives you a completely different appreciation for the meaningfulness and impact of the work." Our internship program offers meaningful work across various functions, including engineering, science, finance, information technology and marketing. Every year, we host hundreds of interns from the world's leading universities. Our chosen interns have demonstrated academic excellence, strong leadership, communication skills and technical excellence in their respective fields. When you join Abbott as an intern, you’re signing up for a whole lot more than a summer job. These 10- to 12-week assignments provide networking opportunities with executives and senior leaders, as well as the opportunity to shape the future and make an impact with life-changing technologies. Interested in an internship at a health technology company like Abbott? Learn more here.